Knowledge work is fast moving and often overwhelming. We are our own factory today. We have to be efficient, produce and get things done. The frantic pace can cause us to often feel overwhelmed day in and day out. 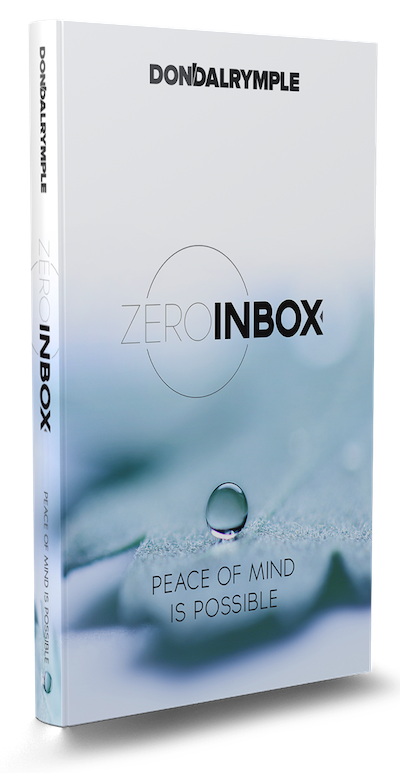 I have worked with teams, executives and entrepreneurs to teach them a solid system of managing their workflow called the ZeroInbox system. Every day, we are inundated with more information that our parents or grandparents ever dealt with. Those inputs are not going to go away. Our work is virtual and demands our attention, focus and execution. It is the way of the new economy. I wrote this book, ZeroInbox, to help anyone that wants a straightforward approach to managing their email and other technology systems day in and day out. You will get back time and attention from applying these strategies in your specific work life. Order the book at Amazon here. Learn these methods for yourself and discover the steps for building your own habits of personal productivity. Learn what it means to lead your life and gain control in areas that can seem overwhelming. Each day presents so many unknowns from all of the people that are able to create work for you by simply sending an email that demands your attention. This approach allows you to be ready for anything that comes your way. Read the book and get the personal consulting for productivity at your own pace. Welcome to the journey! I write regularly on strategies for increasing productivity, sharing tips and tools that can help you move quickly towards action. You can keep up with these articles by subscribing to my weekly newsletter or simply scan and follow when you have time. You can read more articles by clicking below. I would love to hear your comments and questions on articles that resonate with you. A ZeroInbox system to your work increases your productivity via a leadership approach to your work. It is using the right tools, process and behaviors to get work done consistently. When you have clutter in the form of hundreds of emails, lots of paper, unreturned calls, unread magazines and the myriad options demanding your attention, you are operating at low potential. You miss opportunities and can lose credibility as someone who gets things done. It does not have to be this way. If you are committed to learning a better way, then your world can change. I consult and teach on the ZeroInbox methods in articles on productivity, speaking engagements and seminars, and leadership consulting. If you would like to learn more to achieve higher levels of success, connect with me by filling out the form below. Thanks and I look forward to being of help to you.